The Maltese is a small, hairy dog famous for not shedding. One of the most striking pieces of Maltese dog information is that a lot of people suffering from dog allergies can keep this specific dog without problem, in large due to the fact that it has no undercoat. 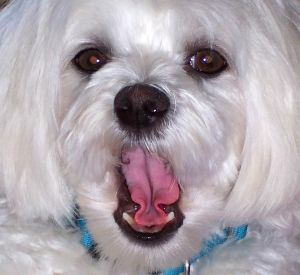 The Maltese dog is an ancient breed whose history can be traced back any centuries and it has been know under a wide range of fanciful names, such as Maltese Lion Dog, Comforter Dog, the Roman Ladies' Dog, Spaniel Gentle, Melitaie Dog, Maltese Terrier, Bichon, Shock Dog and Ye Ancient Dogge of Malta. One of the advantages of the Maltese is that is lacks undercoat, and therefore sheds little or nothing at all as long as you provide it with proper Maltese dog care. Brushing and combing is a very important aspect of proper Maltese dog care, since an unattended coat tends to end up as a matted mess. You can also opt for a short coat, but this will require regular trimming to keep the short length. If the area around the eyes of your Maltese dog becomes discoloured, it is due to so called “tear staining”. 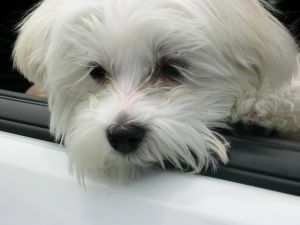 You can avoid or at least minimize this by cleaning the face of your Maltese at least once a day. Some owners have reported that the problem is reduced when they give their dogs chlorine-free water and avoid serving foods treated with food colouring. The Maltese is generally a healthy breed and taking care of various ailments is therefore not a common part of every day Maltese dog care. Health problems associated with the breed are portosystemic liver shunt, luxating patella and progressive retinal atrophy (PRA) but they are fortunately enough fairly uncommon. Few things in the world are cuter than a small Meltese dog puppy, but before decide to bring one home you should ask yourself if you are willing and able to care for an adult Maltese for the next 15-17 years? Will you be able to devote sufficient amounts of time, energy and money to your new family member? You should also ask yourself if the Maltese dog is the perfect breed for you, or if some other breed would be even more suitable for your specific situation. The Maltese dog is generally friendly, but it can be intolerant of small children and other dogs. If it perceives them as a treat, it can even attack them. This doesn’t mean that the breed is impossible to keep with children; it simply means that you have to teach your kids how to approach the dog in a way that is non-threatening. If your children are too young to understand this concept, a sturdier breed is probably a better idea. Getting a Maltese dog puppy can be an excellent idea if you are allergic, since this breed is famous for being tolerated even by people who are allergic to dogs. You should however keep in mind that quite a few of those who suffer from dog allergy are allergic to the Maltese as well. The best course of action is to spend a lot of time with Maltese dogs indoors before you decide to get your own Maltese dog puppy. Basic Maltese dog training should start as soon as you bring your Maltese puppy home, because Maltese dogs need plenty of training before they become fully house trained. Consistent Maltese dog training is required and using a crate is normally the easiest way of getting anywhere. Early Maltese dog training should also involve social training, because the Maltese dog is standoffish by nature and if the dog is not properly socialized from an early age this natural inclination can turn into extreme shyness and anxiety, or even aggressiveness. According to the American Kennel Club standard, the aim of Maltese dog breeding should be to create affectionate and gentle mannered dogs that are both playful and vigorous. When it comes to outer appearance, the aim of Maltese dog breeding should be to develop dogs that are covered from head to foot with a mantle of long and silky white hair. The recommended adult weight is 4-6 pounds, but up to 7 pounds is allowed. When choosing between the many Maltese dog breeders, it is important to stick to reputable ones that produces well socialized and well cared fore puppies with a healthy genetic heritage. Being an extremely cute toy breed, the Maltese dog is often produced by puppy mills that only strive to produce as many puppies as possible as fast as possible to earn as much money as possible, with little or no regard for the health of the breed and for the individual dogs. There are also quite a few Maltese dog keepers who breed their dogs quite randomly without knowing anything about how to promote good health in the breed. When it comes to this specific breed, you should be extra suspicious if you are offered Maltese dogs that will not grow heavier than 4 pounds as adults. A 10-12 week old Maltese dog puppy should ideally weigh at least 2-3 pounds already, otherwise the risk is high of getting an unhealthy Maltese. The exact Maltese dog price varies from breeder to breeder and also between different parts of the world. When you compare the different prices, make sure that you know what you actually get for your money. Will you get a Maltese puppy that has been examined by a vet, vaccinated and de-wormed, or will you have to pay for this out of your own pocket? Will you get a Maltese puppy that has spent its first important weeks in a great kennel/household? Is the Maltese dog price high because the puppy hails from healthy, high-quality ancestors or is it high because the seller is the greedy owner of a puppy mill?